In today’s global environment, everyone’s contributions have a shelf life. Now, more than ever, company leaders need to learn how to engage the entire company in a process of continuous improvement — and innovation. Development programs should, therefore, not only support individuals; they should also express the company’s values and culture. To determine if your development programs are producing the leadership your company needs, you must conduct a customized, multi-layered self-assessment. 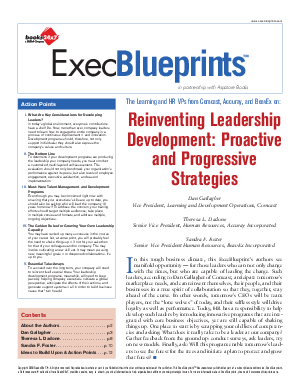 This evaluation should not only benchmark your organization’s performance against its peers, but also levels of employee engagement, executive satisfaction, and ease of implementation.